The Knitting Pirate » In Which the Pirate Orders Yarn. « In Which the Pirate is Pleased With Her Progress. In Which the Pirate Orders Yarn. I was reminded recently that I'd promised to knit a bag for my friend Riya, who made me the most gorgeous dress I've ever owned. It's gold velvet and brocade, and I need the help of two people to get dressed, and it requires a hoop-skirt underneath it to look right. 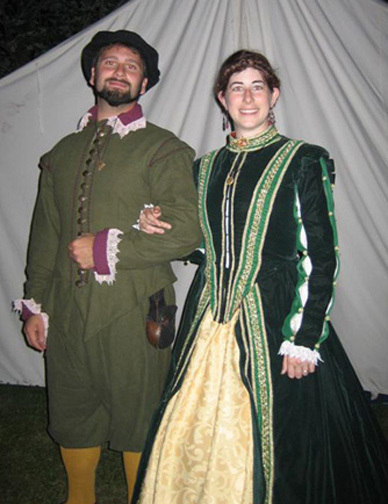 I wore it last Pennsic to the Hoity-Toity Party at Casa Bardicci, and I have never had so much fun at that party because always before I felt under-dressed. Anyway, I said to myself that I would knit a bag for Riya. I even told her that I was going to do it, because that way I'd be held to my statement. I picked out the bag (shh, it's a secret as to which one), bought the pattern, and tried to find the yarn at one of the LYSs here. No luck! Well, Friday night I talked to Riya on the phone and that reminded me of this bag, and I said to myself, "Self, you're going to have to order the yarn online or you're never going to get it," so I went to WEBS and ordered it. I was a few cents short of the cutoff for the 20% discount, so I ordered some sock yarn with Pirate-Husband in mind, which saved me almost $14, or just the price of a ball of Trekking XXL... I consider this to be a free ball of Trekking, and let no one say that I could have saved $14, because I already know. Today I spent some time with Pirate-Mom, who was putting the finishing touches on a lace-ish cardigan for her granddaughter/my nieceling. "You really oughta knit something for yourself some time," I said, and she agreed - she wants to knit a lace stole to wear at fancy events. She's always getting dressed up and going somewhere. So she inspected my Ostrich Plumes Scarf, and decided she really liked that stitch pattern. We checked out some yarn online and she ended up ordering three hanks of Alpaca Cloud in "Smoke Heather" from KnitPicks. It's inexpensive enough, she says, that if she doesn't like it, she won't feel bad (and she's sure I would volunteer to buy it from her). This entry was posted on Sunday, November 4th, 2007 at 20:15 and is filed under bags, lace, yarn. You can follow any responses to this entry through the RSS 2.0 feed. Both comments and pings are currently closed.